After 4 years and 10 months away sailing around the world we are back in our new home in Comox on Vancouver Island. We lucked out getting a spot in the marina for our boat. We are now busy emptying our storage locker into our house, buying a new car and removing stuff off the boat. It's all a bit much, maybe should have stayed out cruising, but it is nice to be home. At the same time we are doing some hiking and kayaking with friends here. Tagish is now sold. On to new adventures. This blog may be reactivated at some point. From Neah Bay we spent the next night at Esquimalt where air temp finally was warming for our tropic bodies. Next night on to Victoria, motoring no wind. Treated ourselves to an expensive marina there. Got some shopping done and cell phone activated. Email us for #. Spent next night at Prevost island anchored, and last night anchored at Nanaimo. Hope to be in Comox in two days. June 11 we left Honolulu for Hanalei bay on north side of Kuai. 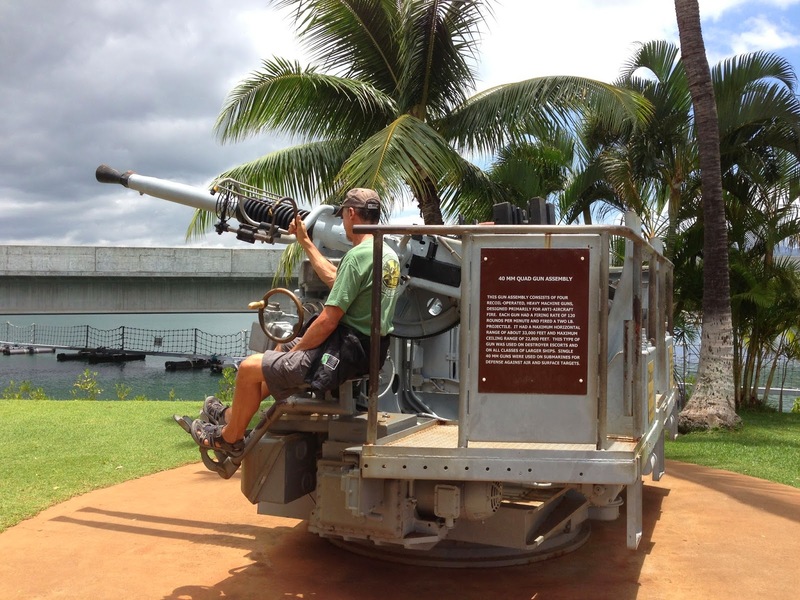 We stopped at Ko Olina Basin for some diesel first, which is a few miles west of Honolulu. We had little wind until we got to the NW corner of Oahu and then 20 to 25 knots from the East hit us, giving us maybe 30 seconds warning, though we could see it coming on the water. It was a vigorous overnight sail and we arrived the next morning and anchored in an attractive bay. We spent two days here exploring and getting our last walks in and a few more groceries for the long passage ahead of us. At July 14 7am we were off for home, 2600 miles to NE. The theory is to head due North to get around the North Pacific High that forms in summer. Then, when you pickup the N westerlies turn and head to the Juan de Fuca Strait. We have a new toy on the boat, an Ipad, and we put a app on it called HF Fax which gives us good weather faxes by sitting it next to our HF radio. We have no pactor modem or other source of weather except the high seas forecast which is also broadcast on the HF radio. These weather faxes shows the positions of the highs and lows. There did seem to be a good solid high forming when we left, but later it would form then break up and reform. I believe it is suppose to block the gales that come across the Pacific. After 45 minutes of motoring to clear the land our wind started. Soon we had 3 reefs in the main in the strong E winds. This first day of our passage turned out to be the best as far as mileage made as we had steady strong wind on the beam. The wind soon came more N East which slowed us down and made us drift off to the west a bit, which is okay. We would get a few small squalls every evening just to keep us on our toes. We are still loosing ground slowly to the West due to the ENE winds, good sailing though. June 19 winds getting lighter now, sometimes down to 7 knots and then back up to 15. By the 21st of June we are motoring at 33deg North. 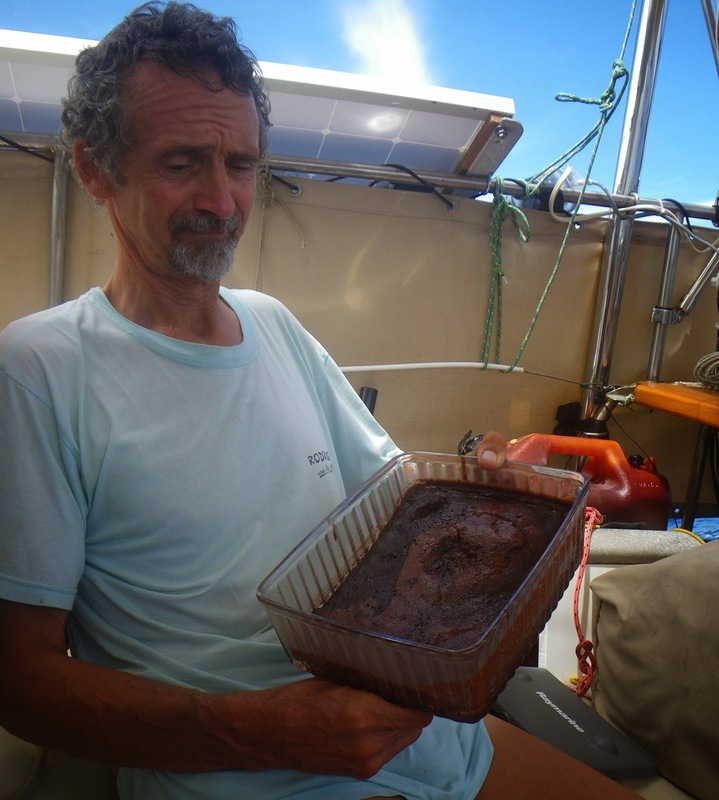 We motored for 30 hours and by mid morning the next day we got our first NW winds of about 12 knots. This is good, we are lucky to get the NW wind this far south. The weather fax shows the high is split with a ridge between them at 33N. By dark the NW winds are up and we have 2 reefs in the main, but we are on course for home. The next couple days are good sailing, though very rough seas for the first day, which gradually eased up to smoother sailing. The weather fax now shows a large gale coming across the Pacific just above us at about 40deg N. We changed our sails to wing and wing so as not to go North so fast and head more East to allow this gale to go by above us. It has been slowly getting colder and we now have all our warm clothes on. Since we got the NW winds we have had no more squalls, but the sky is much more overcast. The next day the wind got up to 23 to 30 knots and large rough seas as the gale above us went by. We must have got the outer edge of it. Officially gale force starts at 34 knots. Had a rough and windy night with 3 reefs in main. By the following day things were easing and we were soon back to 1 reef in main and nice sailing. Much colder now, we spend most of our time inside the boat with the door closed and the wind vane steering, we just go out for a quick look every half hour. The AIS alarm will tell us if any ships are nearby. June 28 wind died and we are now sailing at about 1.5knots. We used this opportunity to clean up a bit and baked some bread. I noticed a line trailing about 6 ft from the back of the boat. I grabbed it with the boat hook and pulled the end up to my hands, but could not pull it off it was stuck on prop. We must of snagged it some where along the way, it was not one of our ropes. I started the engine and briefly put engine in gear, prop turned but I could tell it had some resistance. I went in reverse and forward a few times and line disappeared but still not feel right. Since it was somewhat calm out I put on my wet suit and went off the back of the boat with a knife and had a look but the rope was now gone and all looked okay. So back on board I tried the engine again and everything was okay. That is cold water. The AIS alarm went off early evening, meaning we had a ship that was going to pass any where from 0 to 1 mile of distance from us. The AIS told us this while ship was 12 miles away. We were only sailing at 1 to 2 knots so I called him up on radio and he said he would miss us and that he did going by us by about a mile. We then motored for about 4 hours and then the wind picked up and by 10pm was 25 to 30 knots and for about 30 minutes kicked up to almost 35 knots. Don't know where that came from. By late in night wind eased and we got heavy rain and still raining in the morning in a 15 knot SE wind. Now at 41deg N and 146deg W. Still getting nice clear weather faxes on our Ipad. They show we may be getting hit by a gale that we can see tracking across Pacific only a couple days behind the previous gale that just went by. What's going on, not suppose to be getting all these gales this time of year? This gale was hard to track on the weather faxes as it seemed to move around a bit and then kind of took us by surprise as it expanded and nailed us. By 11pm June 30 we had a gale blowing out of the SW. We had 3 reefs in main as it built and then put the tiny 4th and last reef in and no head sail. We were still going 6 to 8 knots. So I put out our car tire we have been carrying since I bought it in Sri Lanka for the Indian Ocean. I had been wanting to try it ever since I bought it. Well it works, it slowed us by a knot or 2 and helped guard against a bad knock down. The waves were getting gigantic now with huge breaking crests. After another hour or 2 we were getting up to 8 and 9 knots of boat speed as wind increased and this was steady speed not surges. So I figured this was time for a real drogue and got out our gale rider. I managed to pull up the tire between surges up close to the boat and left it and throw over the Gale Rider and let out about 60 feet of our 300ft line. This slowed us down to 4 to 5 knots, much better. I am not sure how strong wind got as we have no wind instruments. But It was over 40 knots for a quite a while, you could see wave tops being blown off and streaks of foam. Then eased to a steady 35 to 40 knots later. Shortly after putting out the Gale Rider we had a small drama through my own mistake. We had the genoa rolled in except for about a 3ft tab that out to the end of our running pole which was still in place. The tab was sticking out to front with pole, not to side. I noticed it was starting to vibrate quite a bit and shake the forestay. I should have left it but decided to remove pole and roll in genoa. I got the pole off as the boat gyrated all over the place. Then we tryed to roll in genoa and it would not budge, then I noticed there was no rope left on the drum because it had been rolled so tight as we rolled it up in the high winds. It was a new genoa and I guess I did not but enough rope on the drum for a tight genoa. So now I had to pull the furling line to bow and wrap about 4 turns around the drum which is easy to do on ours normally but the conditions made it difficult. But by the time I got all this done the 3ft genoa tab was flogging away and got the sheets tangled and also the wind loosened up the genoa and more of it started to come out and soon almost half the genoa was out and flogging like crazy and fore-stay was shaking badly. Big trouble now. I now had the furling line sorted okay but we could not role in the genoa as the sheets were twisted around it. I had to pull both sheets back to the bow and they whipped around like banshees threatening to take my head off. I managed to get them under control and do several wraps around the forestay to untangle them and then they were okay and I had to bring them both up the lee side of boat and sheet them together on the winch as they were all tangled up. but we managed to finally roll the genoa back in after unrolling it a couple of turns to get it straight. We got all the genoa back in except for about 4 ft of it. and sheeted it as you would if sailing. We did not need any more sail out but nothing we could do and the drogue keep us an good speeds. The reason we could not roll all the genoa in is because while half the genoa was out flogging I thought it might break the forestay, so I had moved our spinaker halyard foreward for support if fore-stay broke. So when I rolled genoa back it I forgot about the spinnaker halyard and it got wrapped inside the genoa and made it so we could not roll it all the way in. We managed to get this untangled the next day when wind eased. The conditions were the worst we have seen on our trip around the world. By midnight the wind started to ease, so it was a 24 hour gale and we had the drogue out for over 10 hours of that. At first light we pulled in the drogue. Retrieving the Gale Rider was not too difficult. I pulled it in by hand, by pulling in about a foot every time the boat surged back as a wave passed. I always got overrides if I used a winch. Just had to watch your fingers on the cleat. Wind was about 25 knots and slowly dropped to 15 during the morning. We were both very tired as had not got much sleep and the easy conditions were welcomed. We had a couple of good days with the wind up and down and a few hours of motoring. Then the next gale got us, we could see it coming on the weather fax but not much we could do as were too far North now. We are at 44N and 138W and as usually happens it started just after dark so it is hard to see the seas. We put in the 4th reef about midnight as the wind got up to 35 knots. This gale was not nearly as bad as the first one with winds 30 to 35 approx and only lasted 12 hours. Now back to good sailing in brisk winds. Only 400 miles to the Juan De Fuca strait. Next day was very foggy and we used the radar every half hour to look out 20 miles around us. Conditions are pretty good, getting more sun now and winds up and down. The high seas forecast says there will be a gale 60 to 200 miles off Cape Flattery about 12 hours after we hope to arrive there. So we are putting the peddle to the metal to beat it. We are feeling upbeat as things are looking good and we are almost home. We almost ran over a whale this afternoon, just missed him by a few feet. We saw several more humpback whales, what a thrill to see one of them spy hopping. Later a large pod of dolphins came by to follow along for a bit, I always think of them as a good luck symbol. One day to go and the wind is 22 to 27 knots and we are pushing the boat hard, just flying along often at 7 and 8 knots. We can now see the mountains on Vancouver Island Then as it gets dark can see a light off Cape Flattery. The wind dies with about 10 miles to go and we have to motor. My tide table on electronic chart says we will get there near maximum ebb of tide, darn. Late at night we enter the Juan De Fuca strait and soon the ebbing tide slows us down to 2 knots. The swells steepen as they meet the out going tide. Finally, there is Neah Bay and we pull into the well protected harbor and drop anchor at 8am local time. Our boat has been on Hawaii time until now (3 hours with daylight savings). Our Voyage is over and it's a strange feeling. It as taken us 4 years and 10 months to sail around the world. Its been a great adventuer and now it is time to move on to other things. We took the dinghy to shore to phone customs for clearance and then stretched out our legs around the small town. Will continue on tomorrow for home. - Kuai anchored at 22 12.647N 159 30.134W in 42 feet. took dinghy up river on east side of bay and left on beach with boat trailers. -In Hawaii when we cleared in they gave us a cruising permit and they said in was good for any US waters. When we arrived in Neah bay we phoned customs and gave them the cruising permit # and we were done. We had to borrow the marina gals cell phone for the call as could not find a pay phone. Brian thinks this would be good to have onboard when going thru pirate alley. 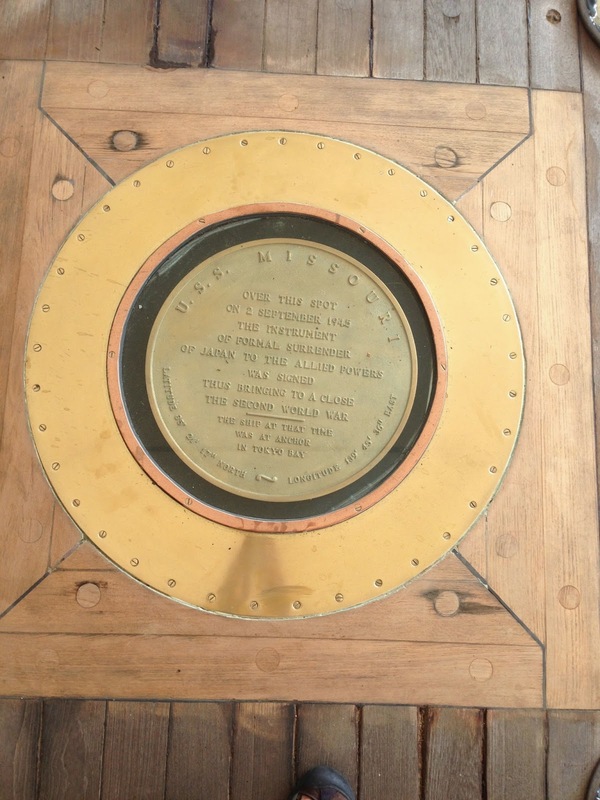 This is the spot on the Missouri where the agreement to end WWII was signed. 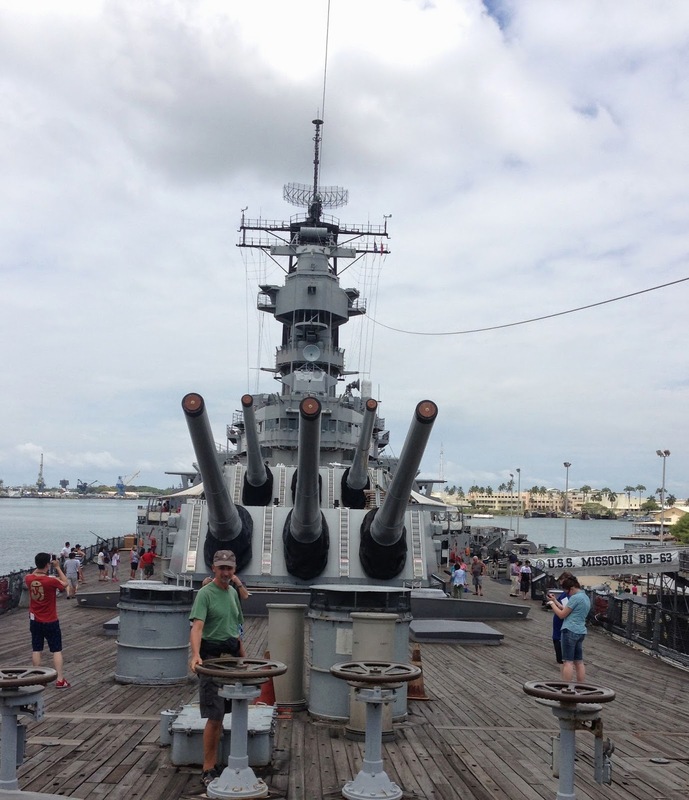 Exploring the warship Missouri in Pearl Harbour. 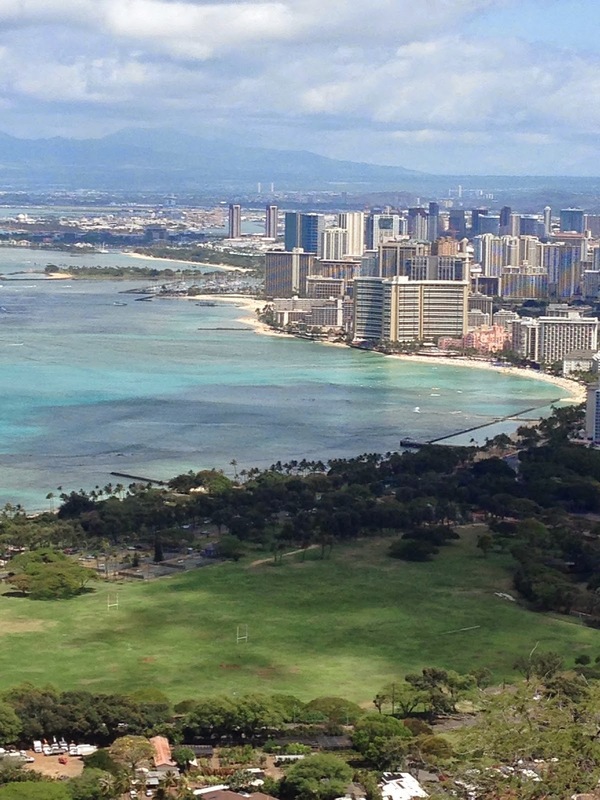 View of Waikiki from Diamond Head. 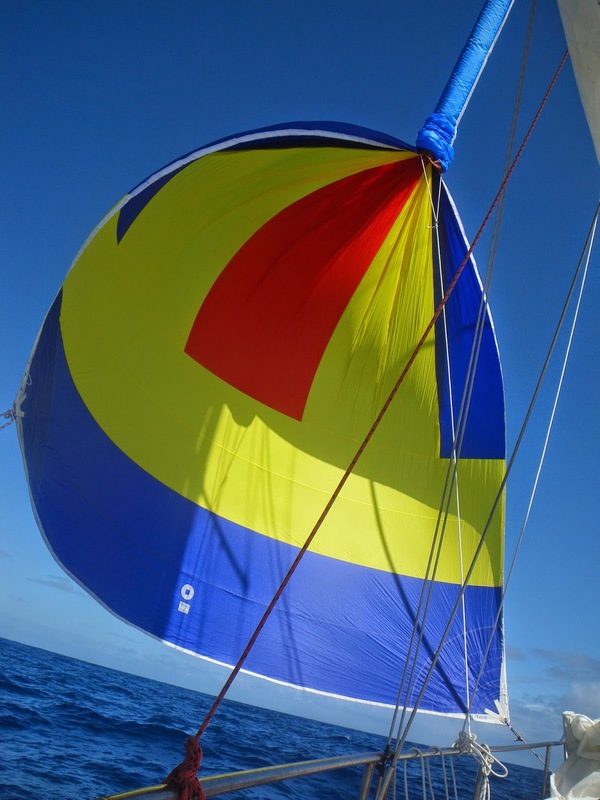 Trying to go a little faster with the spinnaker. Ski slope brownies, that's what happens when you try to bake on passage without gimbling the stove. They tasted good anyway. 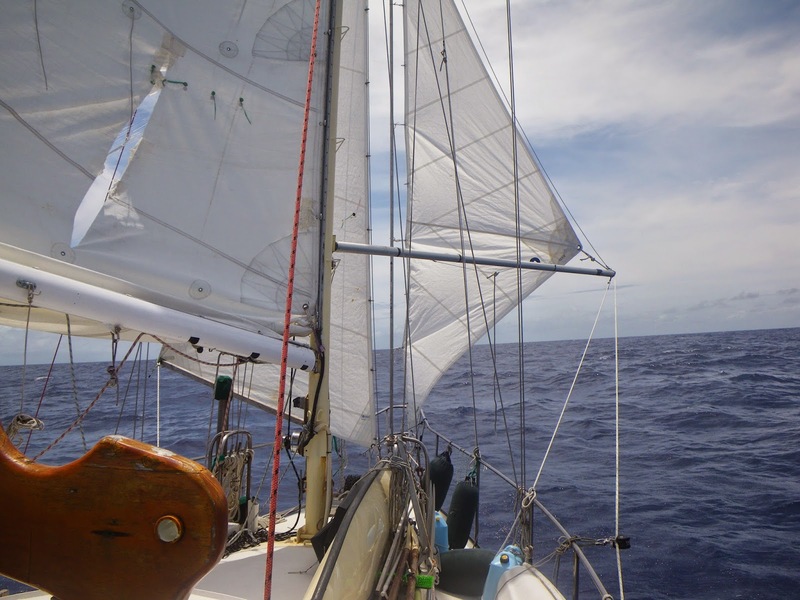 Sailing along slowly with our storm-jib, staysail and our torn main. Tagish is a 36' Brent Swain design steel sloop with Canadian's, Brian and Dorothy on board. Built using the origami method of folded steel. It has 'keel cooling' using the skeg which holds 10 gallons of cooland/antifreeze like a car and using pump in engine is circulated for cooling. It also uses a dry exhaust for better reliability. So no water brought into boat for engine, no impellors or heat exchangers or sea water strainers to mess up. The anchor windlass is manual only, with 200' of 5/16 hi test chain and 100ft of 3/4 nylon on the drum which is mounted on deck. Tagish is named after a lake in the Yukon, Northern Canada where we had a cabin as children. See 2 short video clips of boat sailing-goto older posts in blog at March 4/2011.